Ebolowa - Where is Ebolowa located on the map? Where Is Ebolowa Located On the Map of Cameroon Africa? Where is the Capital City of the Southern Province of Cameroon, Africa? 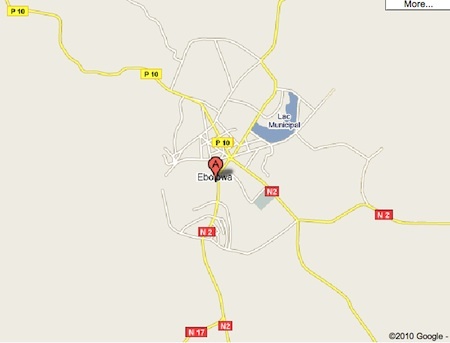 For the Geophysicists, here is the coordinates of Ebolowa, Cameroon are: 2°55′N 11°9′E. Ebolowa, Cameroon is a three (3) hours ride south-southwest from Yaounde, the capital city of Cameroon. The city of Ebolowa lies just at the interest of the highway leading to Kribi in the western region of Cameroon, Yaounde in the center and the resource-rich African nation of Gabon to the south of Cameroon. Ebolowa is linked by tarred roads to Mbalmayo, Cameroon; Sangmelima, Cameroon and Ambam, village in Cameroon. Politically, Ebolowa is the capital of both the South Province and the Mvila division and thus enjoys a host of important administrative services. 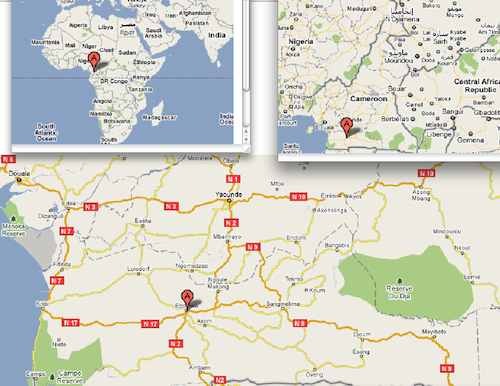 Provided here are interesting maps of Ebolowa, Cameroon. The Ebolowa Maps have different views to enhance your understanding of the village town of Ebolowa, Cameroon Africa.